A timing device most often used when cooking poultry such as chicken or turkey. 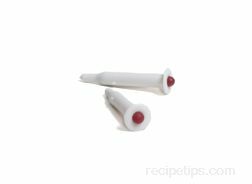 Made from plastic, this type of timer consists of a hollow pointed section or probe containing a heat sensitive mechanism that pops out as the meat reaches the desired cooking temperature. The Pop-Up Timer is inserted into the flesh of the bird until it cannot be pushed further as a broad collar restricts the Timer from going deeper into the flesh. 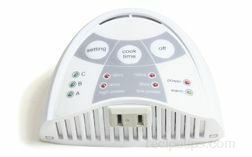 The collar surrounds the colored pop-out mechanism making it readily visible as it protrudes out when finished cooking. 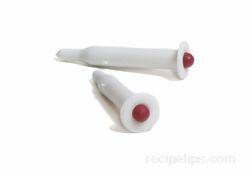 Many poultry processing companies will insert Pop-Up Timers in the bird prior to packaging so it is ready to cook once the package is open. 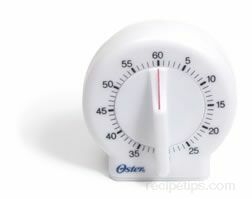 Many food stores and stores selling kitchen products sell the Pop-Up Timers in packages of 4 to 6 for use when this type of timer is desired and not supplied by a poultry processor.